We're certain that you've heard it from many different people before going to Maui as well as when in Maui that "You've gotta eat at Mama's!" Well they're right. It's one of the more expensive spots on the island, and it's not close to where most people stay while visiting Maui, but it's worth the drive and the money. 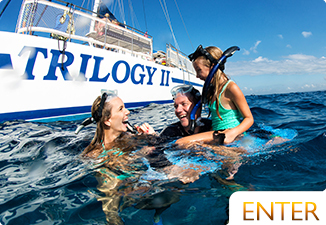 All of the fish are SUPER FRESH and caught LOCALLY. It doesn't get better than that. In fact, to further personalize your local fish experience, on the menu next to each dish, the name of the fisherman that caught that fish is written along with where they caught it. 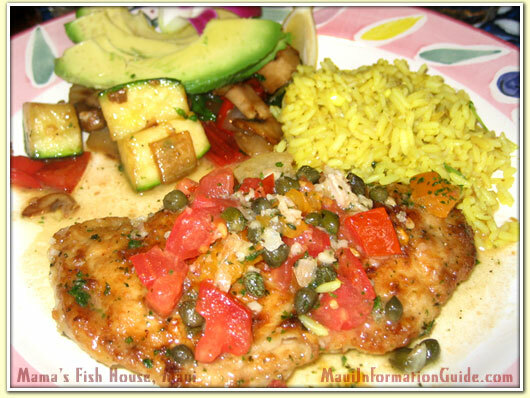 The chefs at Mama's Fish House are masters. They know how to cook a piece of fish to perfection. This is something that can be incredibly difficult given the degree of error in cooking fish properly and the difficulty in having all the plates for one table going out at the same time hot. Other than some great fish dishes, Mama's offers Pork, Chicken, Beef and Poultry, but the menu is rarely the same. If you have a chance, try their Lau Lau. This is a dish deeply rooted in the Polynesian culture, and the chefs at Mama's do it wonderfully. Lau Lau is either fish or chicken baked with pork in a Ti Leaf Package. It's cooked with coconut milk and tropical spices. It's really incredibly tender and delicious. Mama's Restaurant is quite unique. 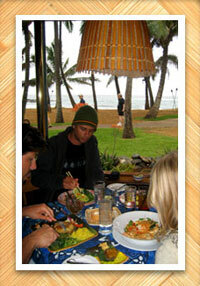 It is by far the most authentic Hawaiian experience you'll have while dining in Maui... and anywhere in Hawaii. Everything is beautifully crafted. There's even a banyan tree that has been grown and shaped into a path way arch. The restaurant sits on a large piece of land right on the ocean with a nice little beach. Always plan to spend a little time checking out the area in front of Mama's before or after dinner or lunch. Mama's Beach is well known for great wind surfing and kite surfing. They also have a few rooms for rent their at the Inn At Mama's. The cottages available are pretty nice with many enjoying ocean views. The service is exceptional at Mamas. They really know how to take care of you there. Some of the niceties that come with your meal are small portions of the soup of the day with freshly baked bread. Ask for Chris E. as your server. Just like the chefs in the kitchen, the bartenders at Mama are well versed in making their specialties authentic and traditionally Hawaiian/Polynesian. They make a mean Mai Tai as well as other tropical concoctions. Jade is a great bartender and makes some delicious cocktails. 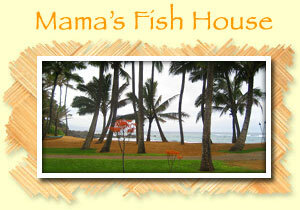 Overall, Mama's Fish House Restaurant is a class act. Make sure to make reservations ahead of time. This place gets packed for lunch and dinner. One of the best meals I have eaten...EVER!!! The service, the food, and the view were all amazing!! And if you want a unique and yummy dessert, you can't beat the "Black Pearl"! Maholo for a WONDERFUL experience!! Probably one of my top five places in the world. The food and the location/view was above and beyond perfection. The staff was fantasticI Cannot wait to go back.... J'dore!!!!! Aloha. We really wanted to go for dinner, but it didn't work out. Instead, we went for lunch and were not disappointed. In fact, I'm glad we went for lunch over dinner because of the beautiful view! I imagine during sunset it could be good too, but it's the wrong side of the island for that. Anyway, the food was incredible. I'm not sure that I agree with the service in your review. It wasn't bad, but nothing exceptional. We'll be back to Mama's next time we visit Maui.